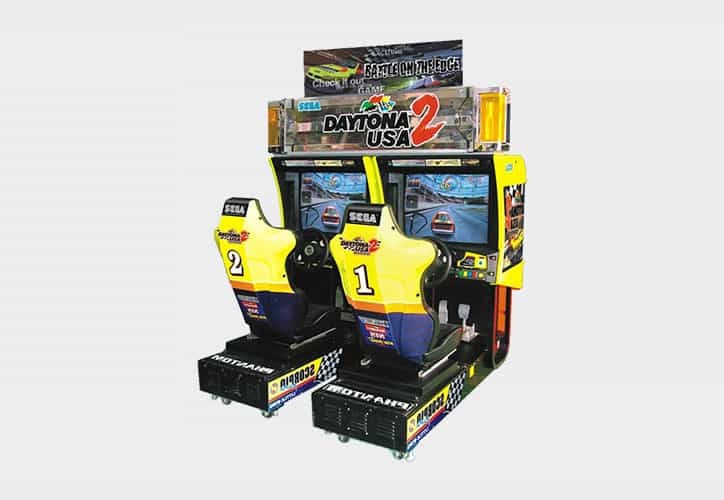 Daytona USA 2 is a two player stock car racing simulator. The player is placed in a high-speed stock car race that he can view from multiple angles. Choose one of three different courses (easy, normal or hard), and choose between automatic or manual transmission. Race tracks are based less on NASCAR driving / courses than the original Daytona USA game. The player will have to master the art of power sliding and more in order to gain mastery of the three courses. Comes with one of the nicest "damage to car" special effects ever made for a video game. The car skid actions are very detailed (tire smoke & burning)!